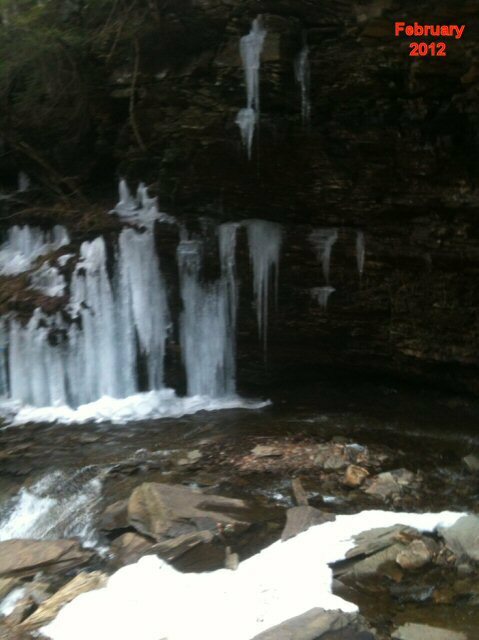 This is the 2011-2012 Pennsylvania Ice Conditions Archive. 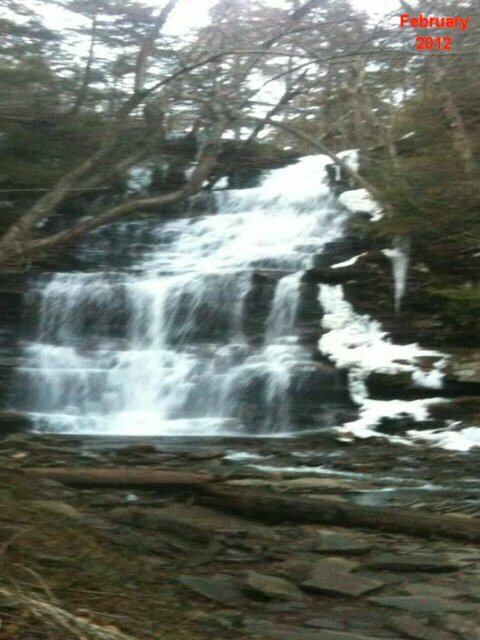 Glenn Ortley took a recon trip into Ricketts Glen this past weekend to determine the ice conditions. Please check the conditions pics he has posted below. On the left are the current conditions (2/5/2012), on the right are pics he took from the same time last year (2/12/2011). Not good folks. I am thinking that this season is going to be a washout for Pennsylvania. Dismal conditions at Lock Haven after the extremly warm temperatures we experienced last week. Here are two pics of Roadside Gully along Rt 120 from Sunday 2/5/12. 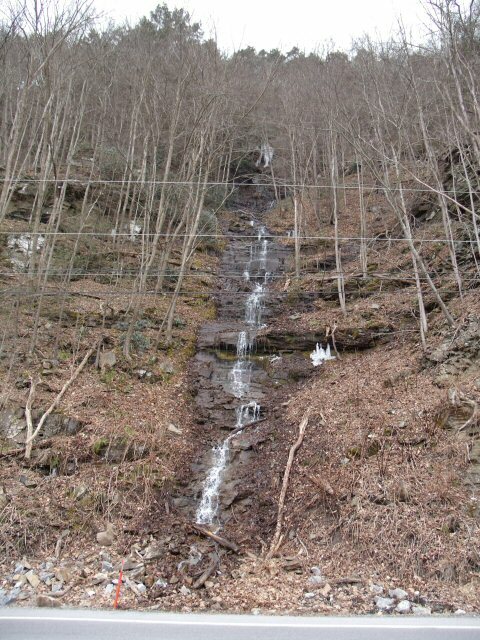 All ice is gone on the approach gully and the first two steep tiers. The only ice that is hanging on is on Glass Menangerie on the third tier. From the road it looks like it barely touches down and appears to be poorly bonded. I am betting it will be on the road by next weekend. No ice was visible when looking across the river at the Gemini Gullies, so I saw no reason to investigte any further there, or at the Hidden Amphitheater. Not looking good. January 8, 2012 - Still waiting for seasonable temperatures. Took a drive up the Renovo Road today to assess the dismal conditions. Here are a couple of shots looking up Roadside Gully. Not yet folks. 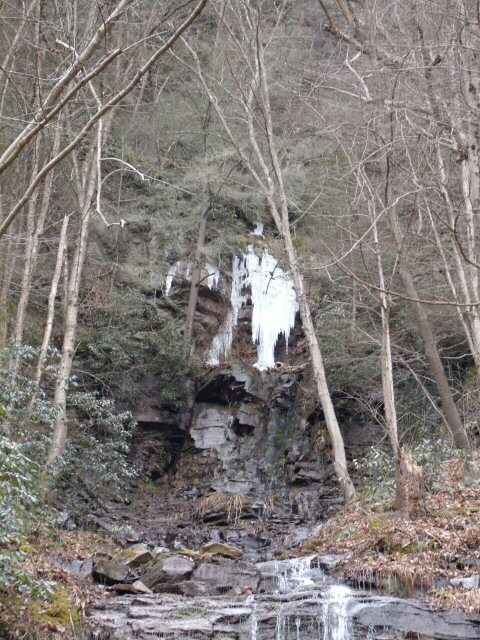 From the amount of water currently coming down the falls, we will need at least a week of single digit temps to bring the low angle approach in. I was surprised to see a substantial amount of ice on Glass Menagerie to the right on the upper tier. Tags: January 8, 2012 - Still waiting for seasonable temperatures. Weather conditions have been unseasonably warm so far this year. Hopefully this trend will end and winter weather will soon be upon us. In the meantime, feel free to check our Ice Condition Archive Pages located along the right sidebar to see what we can expect if the weather cooperates. We have been updating this site for over 10 years now. Please use this site and www.NEIce.com to assist you in determining where to climb.